"The efficient transfer of technology to industry partners is increasingly a key objective for many research institutes and universities. Valuing technology created as a result of R&D activity can assist with creating successful partnerships and with the technology transfer process [it can also assist in destroying successful partnerships, if it's not properly handled]. Issues addressed will include: When and why is IP valuation relevant for research institutes and TTOs? Is IP value a good indicator of whether research funding is efficiently allocated to R&D projects? 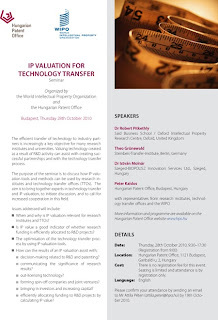 [This question could occupy the whole day, given a chance] The optimisation of the technology transfer process by using IP valuation tools. How can the results of an IP valuation assist with decision-making related to R&D and patenting? communicating the significance of research results? out-licensing technology? forming spin-off companies and joint ventures? bringing in investors and increasing capital? efficiently allocating funding to R&D projects by calculating IP value?". Speakers are Dr Robert Pitkethly, of the Said Business School and Oxford Intellectual Property Research Centre, Oxford, Theo Grünewald (Steinbeis-Transfer-Institute, Berlin, Germany), Dr István Molnár (Szeged-BIOPOLISZ Innovation Services Ltd., Szeged, Hungary) and Peter Kaldos himself. For further information and for registration, click the seminar website here.